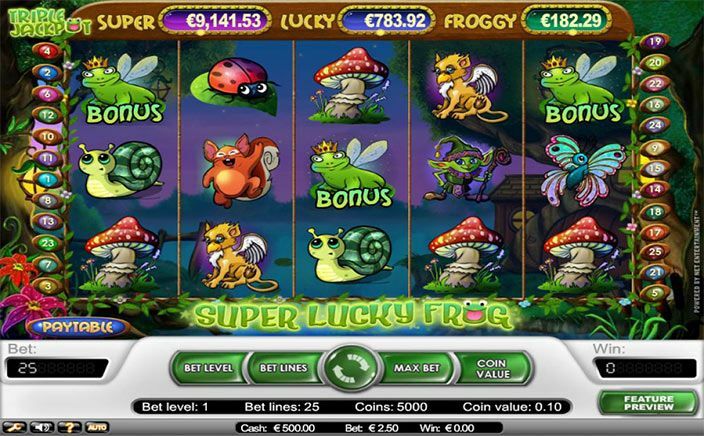 NetEnt is the creator of Super Lucky Frog an animal-themed video slot. This slots game has a great graphic display with exciting bonus features. You have Free Spins and a Jackpot Game. Read the review below for more insight into these features. What you get with Super Lucky Frog is an online slot with 5 reels and 25 active paylines. The five reels have a frame comprising of flowers and the semi-transparent reels reveal a misty lake in the background. It is late evening and purple skies can be seen overlooking a woodland. You can also see a wooden cabin in the backdrop with light emanating from the cabin, as seen from its small window. The symbols on the reels comprise of regular animals and mythical creatures. There is a squirrel, a toadstool, a butterfly and a ladybird available. You also have a unicorn, a small elf and a winged dog. In this video slot, you have a Fairy Scatter, Elf Wild and a Flying Frog Bonus symbol. The Fairy Scatter will activate the game’s Free Spins. When you land a minimum of three Fairy Scatter icons on visible positions on the reels, you will activate the Fairy Free Spins bonus feature. With three scatters you will earn 10 free spins. 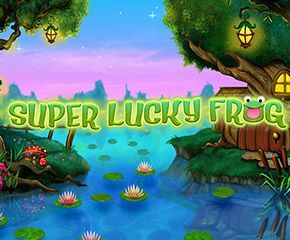 4 scatters will give you 20 free spins and five scatters earns you 30 free spins in Super Lucky Frog. This feature can be reactivated with three additional Fairy Scatters landed on the reels during the round. You will earn a multiplier of 3x your staked sum for combo wins during this round as well. In the Jackpot Game of Super Lucky Frog, you can win one out of a total of three progressive jackpots on offer. You have the Super Jackpot, Lucky Jackpot and Froggy Jackpot available. When you land a minimum of three Flying Frog Bonus icons on visible positions on the reels, you will gain entry into a wheel of fortune game. The higher your bet the larger your jackpot and by landing on the gold coloured “1” on the wheel you will earn the cash reward seen in the top right-hand corner of the playing screen. This video slot has very good graphics display and animation. The whole game has a calming influence on players, the free spins and progressive jackpot games add a little extra to the overall gameplay.